Jim and I spent the weekend with Nate, and by now you all know that he and I love to cook together. 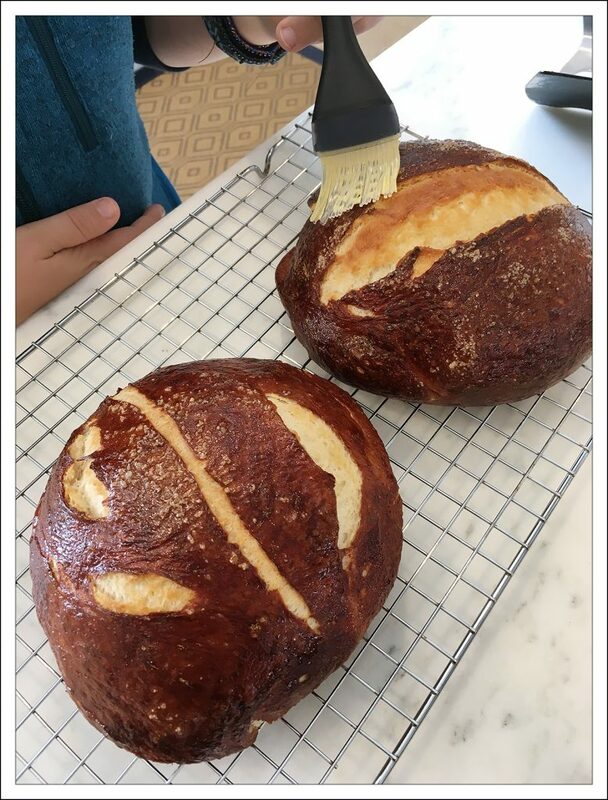 I was trying to think of something different and fun for us to make, and I decided it would be fun to make bread. But which kind? I narrowed it down to Challah Bread and Pretzel Bread. We decided that pretzel bread would go with the homemade vegetable beef soup that we were having for dinner that night. Boy were we right. This bread is fabulous! Our biggest challenge was making sure we had enough left over to serve with our soup when his parents got home. For this project I was Nate’s assistant. He’s becoming a wonderful cook!! The bread was a huge hit with everyone. Even Jim asked me to make some when we got home, and he is not a homemade bread lover. I know, right? 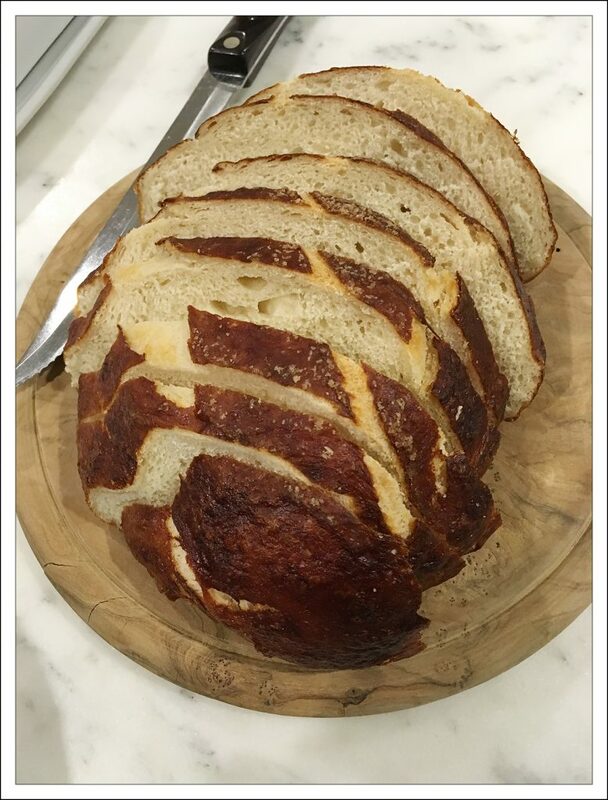 Who doesn’t love homemade bread? Well, Jim doesn’t. Go figure! I hope you will try this recipe and let me know what you think. Here’s Nate measuring the flour. 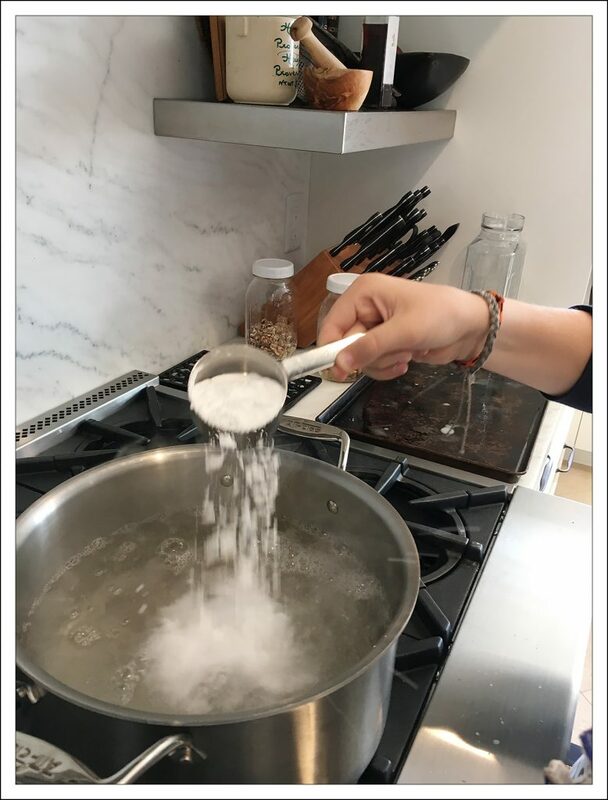 When adding the baking soda to the boiling water you have to be careful and do it slowly because it bubbles quite violently. Brushing melted butter on the loaves is just what this bread needs to have a nice soft, chewy crust. We only made one cut in the top of the loaves and probably should have done two. It helps release the steam and bake better. It didn’t affect the taste, but they would have been prettier with double cuts. We thought it was pretty funny that one of the loaves looks almost like a face. Melt butter, add 2Tbls. water or milk to the butter and set aside. Put yeast mixture in the bowl of your mixer with the dough hook attached. Add salt and butter mixture. Add 2 cups of flour. Mix until the flour is incorporated. Add remaining cup of flour. Mix until incorporated and then increase speed to 4 on a Kitchenaid and let mix until the dough comes away from the sides of the bowl and is slightly sticky to the touch. If any dough comes off on your finger, add a tablespoon or two of flour and mix some more. When done put the dough into a well greased bowl. Cover with greased plastic wrap. Let sit in a warmish place (out of draft) until double in size. It took mine about 90 minutes to double in size. When dough is almost double bring a large pot of water to a boil. Once it's boiling slowly add 1/2 cup of baking soda. When the bread is all formed, drop one loaf at a time into the boiling water. If you are doing rolls you may do 3-4 rolls at a time. Boil for 60 seconds, turn over and boil for an additional 60 seconds. Remove from the water bath and place directly on a well greased baking sheet. Sprinkle coarse salt over the tops and cut a slit or two in the top with a very sharp knife or a razor blade. Bake the bread at 400 degrees for 22-25 minutes. Bake the rolls for 13-17 minutes. When they are done baking brush with melted butter. The bread is easiest to cut when it's cool but I doubt you will be able to wait that long to try it. 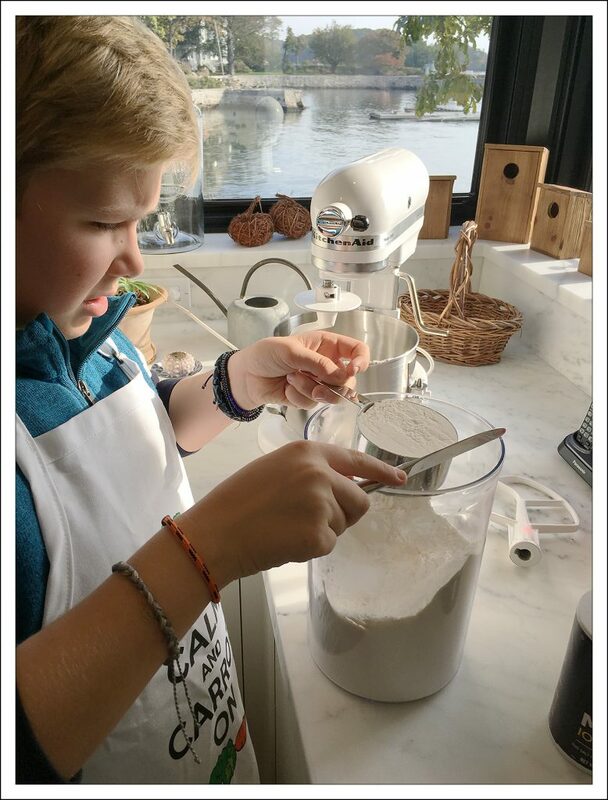 A future chef in the making – wonderful! I think you might be right!! Thank you so much for sharing the recipe! What a beautiful blog post! I want a grilled cheese sandwich made with this bread, and some tomato soup! I agree! I think they sound so good together!